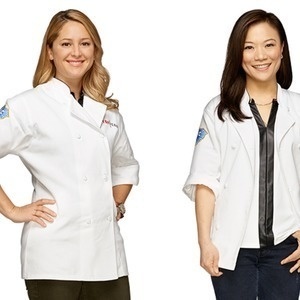 One of these women is America’s new Top Chef champion! We talk to Brooke and Shirley right before the big reveal about their experience on the cult cooking competition and how they bonded during this latest season, filmed in Charleston and Mexico. So who are these two women? Both were on Top Chef in previous seasons and returned for another chance at victory. Brooke is the co-owner and co-chef of Hudson House, The Tripel, Playa Provisions, and Da Kikokiko in Los Angeles, while Shirley is the chef-owner of Steamers Co., a seafood restaurant set to open later this year, also in Los Angeles. Tune in to hear what it's like behind the scenes of Top Chef and see if you can guess who had to pack their knives.